Hi Crochet Spot readers! I’m so excited to be joining the team as a writer. I wanted to take a minute to introduce myself and get to know all of you, too. My name is Claire and I’ve always loved crafting. I learned to crochet in the spring of 2011 from a combination of books, websites, and YouTube tutorials, but I learned the most from messing around with a hook and yarn and seeing what happened. Crochet Spot was actually one of the websites that helped me learn to crochet, so it’s extra special for me to be a contributor and be able to pay it forward. The main reason I learned to crochet was to make dolls and stuffed animals (also known as amigurumi) and doll clothes, which are still my main focus. I love creating things that make people smile. One of the biggest compliments is when people see something I’ve made and giggle because they think it’s cute. I enjoy making handmade gifts for friends and family. I started my crochet blog, Once Upon a Yarn, in 2012 and have posted over 80 free crochet patterns. It brings me joy to share the love of crochet with others. I’ve taught over a dozen people to crochet, from kids to adults, and my philosophy is that anyone can learn to crochet with a little time and patience. Crochet is for everyone! When I’m not crocheting, I’m probably reading or writing – I’m studying English and French in college, which means I spend most of my time surrounded by books. I enjoy writing novels in my spare time, and I also enjoy crocheting things inspired by fictional characters. 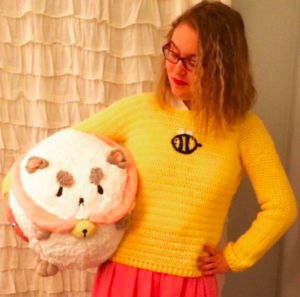 The picture in this post shows a sweater I made a few years ago based on the comic Bee and Puppycat. I absolutely love designing pattern requests, so let me know what you’d like to see and I’ll do my best to design it. You can find me online as @onceuponayarnblog on Facebook and @crochetbyclaire on Ravelry. The crochet hook size you use greatly depends on what you are crocheting and the weight of yarn you crochet with. If you’re crocheting with thread, you’re likely to use a very small crochet hook. If you’re crocheting with super bulky weight yarn, you’re likely to crochet with a large crochet hook. Like most beginners, when I first started crocheting I wasn’t sure what size crochet hook to buy. I ended up purchasing a small set with a variety of crochet hooks, which I still use today. Now, as a more experienced crocheter, I found my most used crochet hook size is an I (5.50 mm) crochet hook. I use a lot of medium/worsted weight yarn and make a variety of items such as hats, scarves, blankets, home decor, etc. Of course there are plenty of other crochet hook sizes that I use, so a set with different sizes is what I always recommend to others, but if there is one crochet hook that I would get duplicates of it’s the I (5.50 mm) crochet hook. What is your most used crochet hook size? 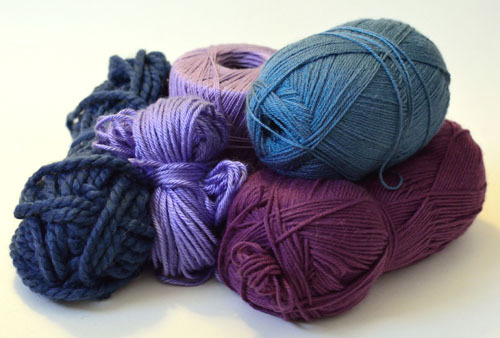 What type of yarn do you typically crochet with, and what do you often make? Share your experience below and see what others are saying! Summer will be here soon! What are some things you are looking forward to crocheting this summer? I’m always looking for new ideas for patterns to make, so now is the time to share yours. What crochet patterns would you like to see on Crochet Spot this summer? Is there a crochet pattern that you’ve been searching for but can’t find? Share your pattern ideas in the comments below! Over the years some of the best patterns that I’ve made have come from requests from readers like you. So this year, in 2018, what are some patterns you would like to see? Are there patterns that you’ve been searching for but can’t find? Do you want a pattern for something quirky and unique? Or perhaps something classic that you can use over and over again? Are you interested in crocheting sweaters, blankets, hats, or scarves? Let me know your thoughts and ideas, and I’ll be sure to incorporate them in my 2018 to-do list! A new year brings new crochet projects and new crochet skills and techniques to learn! What’s on your to-do list? Are you making any new year’s resolutions for crochet? Perhaps you want to make a project that you’ve been putting off, or finish a project that you started a long time ago. Maybe you want to organize your yarn stash. 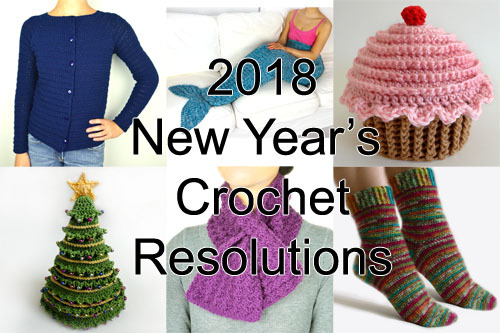 Share your crochet resolutions in the comments below and let’s see if you can carry them out in the new year! I love seeing what everyone is crocheting. 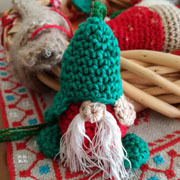 Not only do I find inspiration in other people’s work, but it gives me a nice, warm, fuzzy feeling to know that there are folks all around the world crocheting for the holidays. It makes me feel connected, even if crocheting is usually a solo sport. 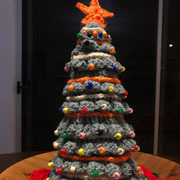 In this post, I rounded up a bunch of holiday crochet photos that were submitted by readers. Enjoy the photos and be sure to submit yours as well to show off your fantastic work! To submit photos email them to me at [email protected] and include your first name and permission for me to publish them on the blog. 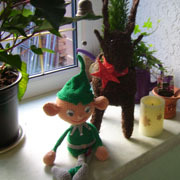 Check out this little guy that Paola crocheted. 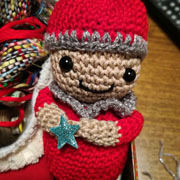 Paola crocheted this adorable cutie with the tiny star. 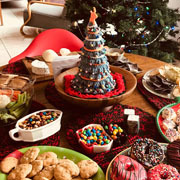 Loving Paola’s Christmas tree and tiny ornaments. 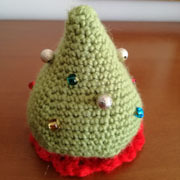 Jesse crocheted the Christmas Tree Hat pattern. Jesse used the tree as a table centerpiece. 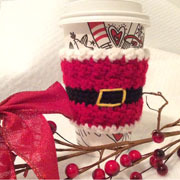 Barbie crocheted this adorable coffee cup sleeve. 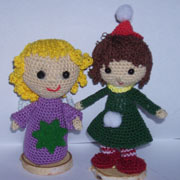 Check out these adorable dolls Monika crocheted. Monika’s elf is hanging out on the shelf. 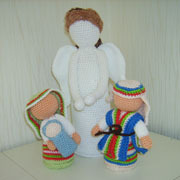 Monkia crocheted this beautiful nativity. 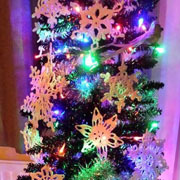 Iona decorated the tree with 40 different snowflakes. 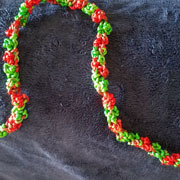 Debbie crocheted a Christmas garland with rat tail cord. 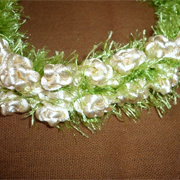 Debbie crocheted this garland to mimic traditional popcorn. What are you crocheting for the holidays? Share your photos by emailing them to me at [email protected] and include your first name and permission for me to publish them on the blog. 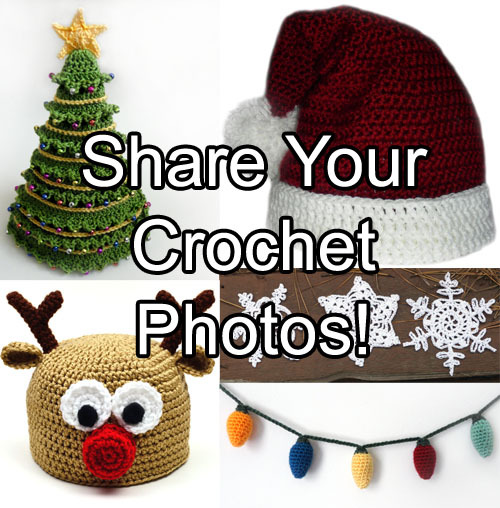 Are you crocheting anything for Christmas or the holidays? Perhaps a gift of a friend or child, decorations for the house? Show off your work and see what others are crocheting! Submit your photos by emailing them to me at [email protected] and I’ll upload them to the blog for everyone to enjoy. Be sure to include your first name and permission for your photos to be published. I can’t wait to see all of your photos. Have a merry Christmas and fun filled holiday season everyone!